The 2017 China Tibetan Culture Picture Exhibition kicked off in Myanmar's Shwedagon Pagoda on Sunday afternoon. Present at the opening ceremony of the two-day exhibition were Yangon Region Chief Minister U Phyo Min Thein, Chairman of Yangon Region Parliament U Tin Maung Htun and other officials as well as eminent monks. Speaking at the ceremony, Chinese Ambassador Hong Liang expressed his belief that the exhibition will be a great opportunity for the Myanmar people to know more about tradition and culture of China's Tibet and it will strengthen the friendship between China's Tibet and Myanmar. U Sein Win Aung, chairman of the Myanmar-China Friendship Association (Central), said the exhibition aims to exchange culture, friendship and Buddhism between China's Tibet and Myanmar. It is the first time of visit to Myanmar for China's Tibetan Culture Delegation and the exhibition highlights the bilateral exchange of Buddhism and culture between China and Myanmar, said Zhu Hongli, an official from China's State Council Information Office at the opening ceremony. 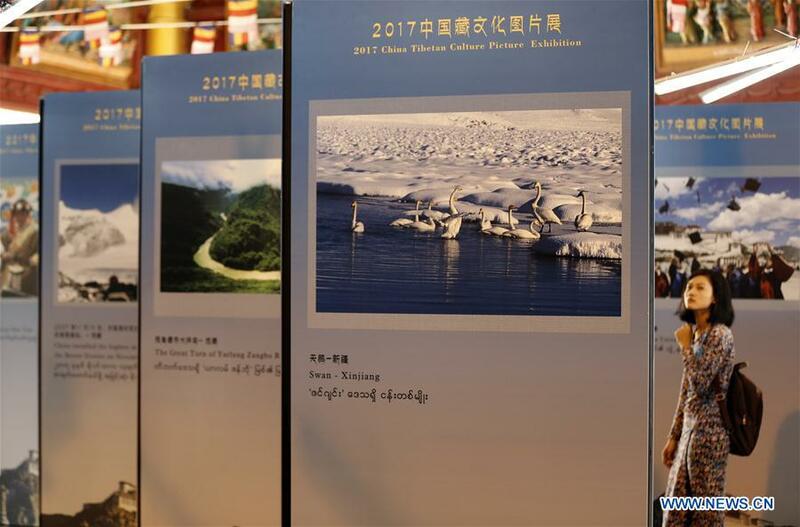 Photos portraying everyday lives of Tibetan people, culture, art, language, beauty, natural resources and other significant norms of China's Tibet are being displayed at the exhibition.